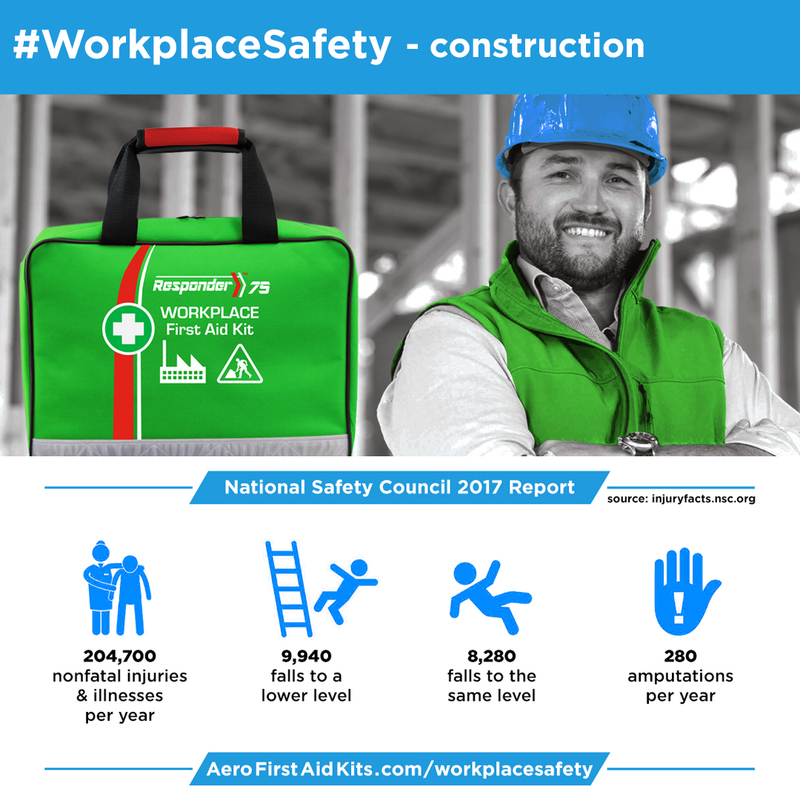 The National Safety Council 2017 Injury Facts report shows over 213,600 Professional and Business Service workers suffered nonfatal injuries or illnesses that necessitated days off work during 2014. In 2014, employment in the Professional and Business Services totaled 17,005,000 workers, of which 16,571,000 were private sector employees. The Professional and Business Service sector includes legal, accounting, architectural, engineering, computer, consulting, research, advertising, photographic, translation and interpretation, veterinary, and other professional scientific and technical services. Also included are business management and administrative and support activities and waste management and remediation services. The National Safety Council, chartered by an act of Congress, is a nongovernmental, not-for-profit, public service organization. For a free quote and for more details on the contents and regulations met, select a First Aid Kit from the list below. This kit is ideally suited to large office settings to serve 100 nearby staff per cabinet. The contents have been specifically selected to accommodate a range of potential incidents which can occur in any workplace environment. Stored in a heavy duty, metal cabinet this kit mounts easily to the wall and features a large full-swing door which allows easy access to all three shelves and the door compartments. This first aid kit has been designed to cater for medium sized workplaces for 75 nearby staff per kit. Available in a variety of metal, plastic and softpack cases, this kit and includes quality first aid products required to treat injured workers so they are able to return to the job. This first aid kit has been designed to cater for up to 50 nearby staff per kit. This first aid kit includes quality first aid products required to treat injured workers so they are able to return to the job, and is available in a variety of metal, plastic and softpack cases. All-in-one portable Eyewash Station is freestanding or wall mounted, with a drop-down dust cover that opens to reveal an integrated mirror and two easy-open Sterile Buffered AEROWASH Eye & Skin Rinse bottles with eye pieces. Essential for cleaning up bodily fluids in a hygienic and efficient way, this module services up to 10 people. Servicing up to 50 people with one module, these kist are specialised for treating burn injuries. Categories: News, US News. Tagged:first aid cabinets | metal first aid kits | nice first aid kits | workplace safety Bookmark the permalink. 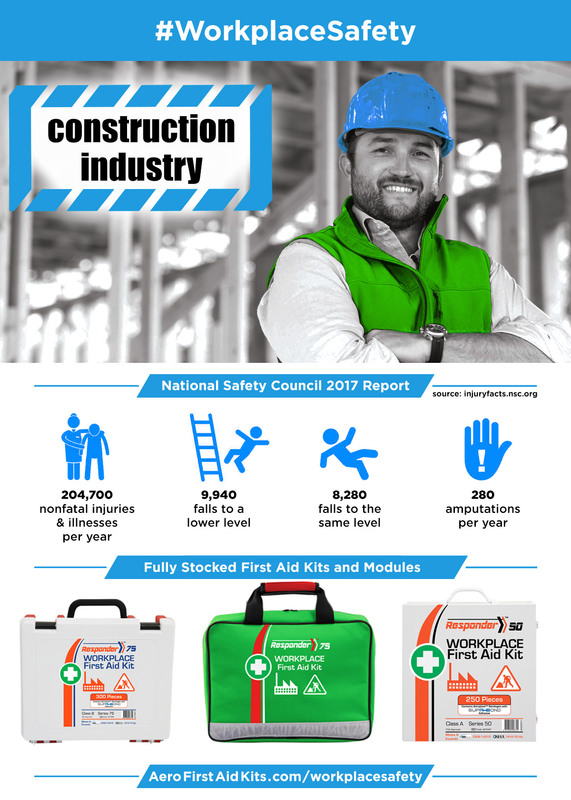 The National Safety Council 2017 Injury Facts report shows over 204,000 Construction Industry workers suffered nonfatal injuries or illnesses that necessitated days off work during 2014. In 2014, employment in the Construction industry totaled 9,813,000 workers, of which 9,390,000 were private sector employees. The Construction industry sector includes establishments engaged in construction of buildings, heavy construction other than buildings, and specialty trade contractors such as plumbing, electrical, carpentry, etc. The National Safety Council, chartered by an act of Congress, is a nongovernmental, not-for-profit, public service organization. This kit is the complete option for industrial settings. In addition to the components found in the standard kits, this kit has a full range of approved relief tablets and medications to help employees deal with headaches, colds, muscle pain and other common workplace ailments. The heavy duty metal cabinet mounts easily to the wall, and the large swing out door opens fully to allow easy access to all three shelves and the door compartments. 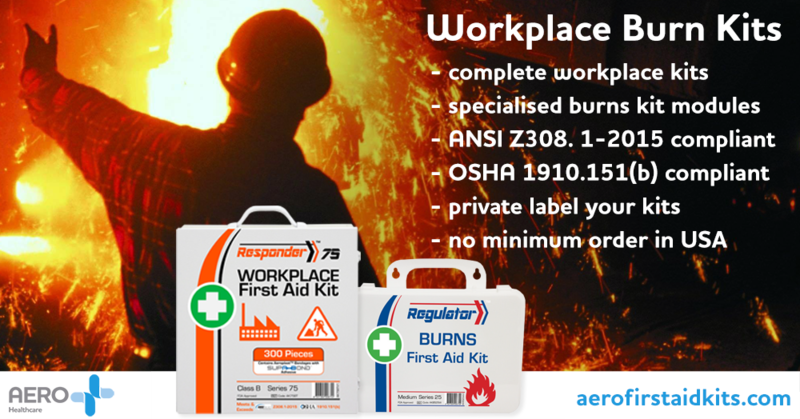 This kit is ideally suited to mid size industrial and office settings, the contents have been specifically selected to accommodate a range of potential incidents which can occur in any workplace environment. Stored in a heavy duty, metal cabinet this kit mounts easily to the wall and features a large full-swing door which allows easy access to all three shelves and the door compartments. 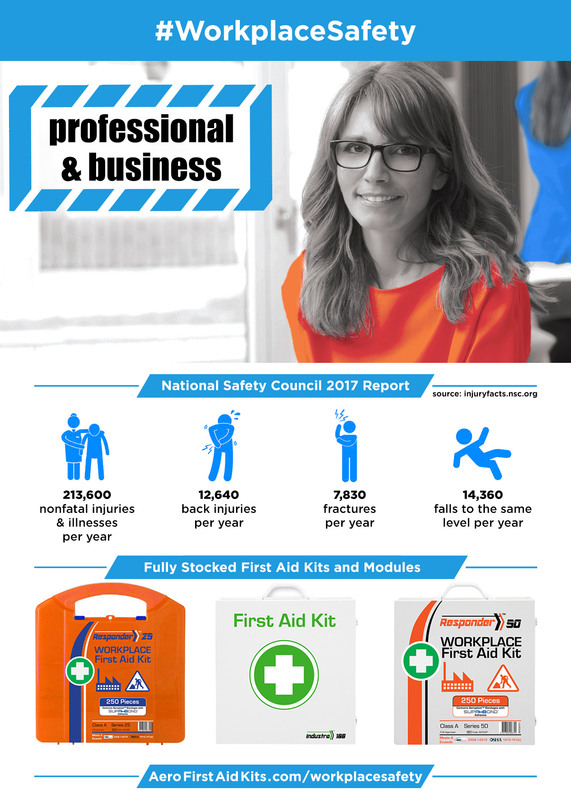 This first aid kit has been designed to cater for medium sized workplaces and includes quality first aid products required to treat injured workers so they are able to return to the job. Available in a range of metal, plastic and softpack case options. Categories: News, US News. Tagged:burn injuries | construction | eye injuries | first aid cabinets | metal first aid kits | rugged first aid kits | workplace safety Bookmark the permalink. 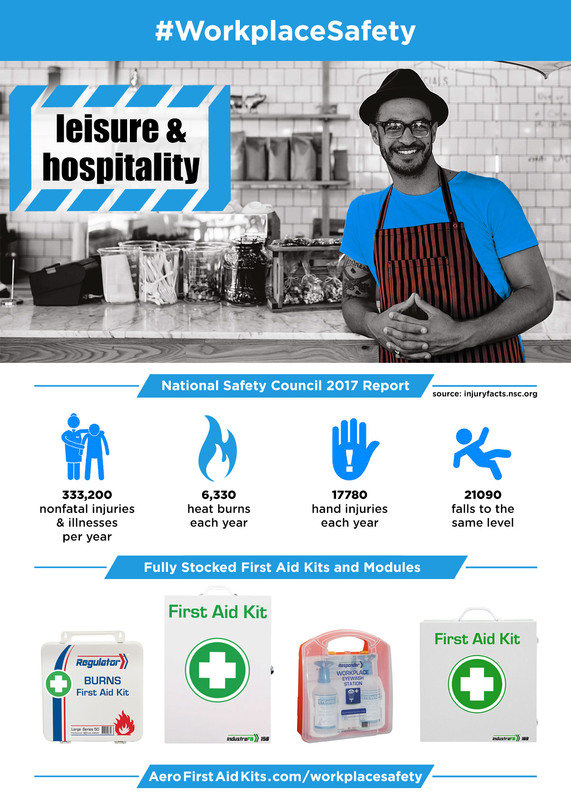 The National Safety Council 2017 Injury Facts report shows over 333,000 Leisure and Hospitality workers suffered nonfatal injuries or illnesses that necessitated days off work during 2014. The Leisure and Hospitality sector employed 13,490,000 people in 2014, of which 13,077,000 were private sector employees. In their report the Leisure sector includes establishments that provide arts, entertainment, and recreation experiences such as theatre, dance, music, and spectator sports, museums, zoos, amusement and theme parks, casinos, golf courses, ski areas, marinas, and fitness and sports centers. The Hospitality sector includes hotels and other traveler accommodations, food services, and drinking places. The National Safety Council, chartered by an act of Congress, is a nongovernmental, not-for-profit, public service organization. 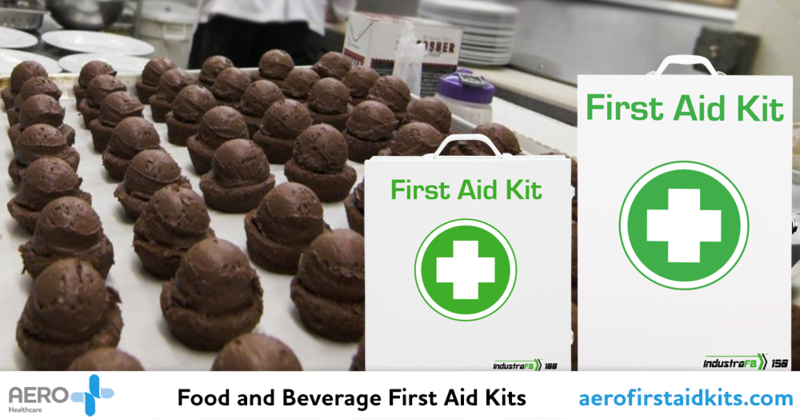 With strict First Aid requirements for businesses that handle food, Aero Healthcare has Food Standards approved First Aid Kits – all our Food-Grade First Aid Kit contents comply with new ANSI Z308. 1-2015 and OSHA 1910.151(b) regulations – in tough metal cabinets sized to suit your clients needs. Our Food Industry kits contain Aero Healthcare’s famous metal detectable and waterproof adhesive bandages and tape that are colored blue – making them easy to identify as blue is the only color which does not naturally occur in food. These First Aid Kits are the ideal solution for any business where food handling takes place. The cabinets can be carried or wall mounted, and are key-lockable for security. All our cabinets are available with private labeling to promote your business or your clients. All kit contents are refilled with our Instant Restock™ system: you can refill and service your clients kits quickly with a single order of refill pouches designed to fit into each cabinet. This kit makes food safety compliance easy for large and industrial environments, and includes a full range of approved relief tablets and medication have been included to help employees deal with common workplace ailments such as headaches, colds and muscle pain. Ideally suited to mid size industries to accommodate a range of potential incidents which can occur in any food preparation environment. Categories: News, US News. Tagged:burn injuries | eye injuries | first aid cabinets | food and beverage industry | hospitality | workplace safety Bookmark the permalink. 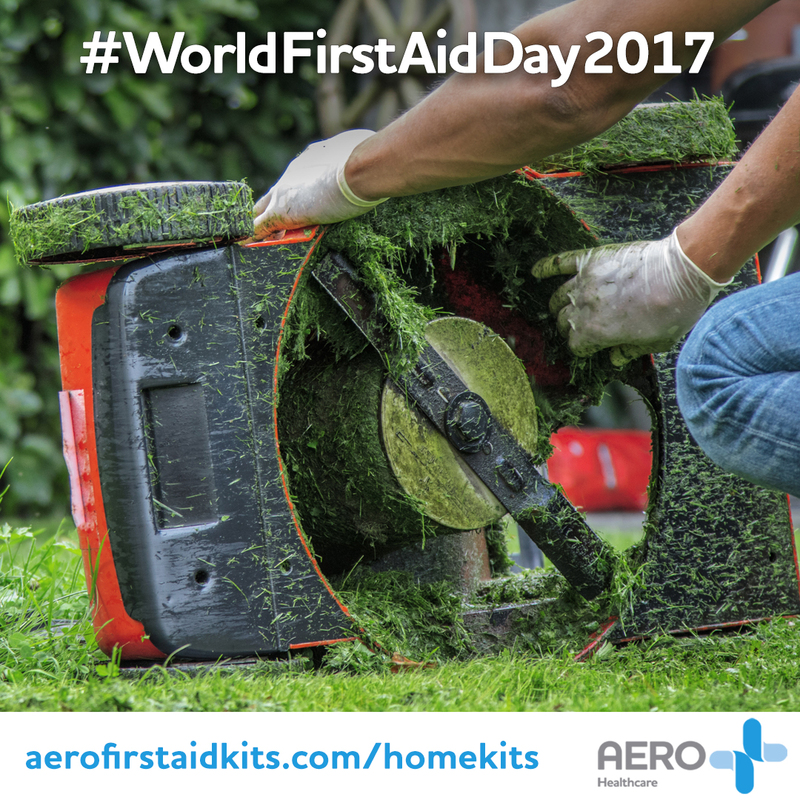 This “World First Aid Day” is highlighting injuries in the home and workplace. Research published shows around 12 million accidental home injuries occur per year that require some form of medical attention, with falls the most common injury across all age groups, followed by cutting/piercing injuries, and then injuries from being struck by or against an object or person. Injury rates were highest among the oldest and youngest age groups, and falls are a significant problem particularly among older adults. Ensure your family is ready for accidents large and small with one of our fully stocked Home First Aid Kits. Categories: News, US News. Tagged:gift ideas | home first aid | metal first aid kits | nice first aid kits Bookmark the permalink. International Water Safety Day is the perfect time to check your preparedness for Water Safety, whether you are boating, swimming or exploring America’s lakes and rivers. Supervise Children watch them at all times and keep within arms reach. Don’t just keep an ear out or allow yourself to be distracted by smartphones and books: drowning children do not splash and shout! Fence Pools ensure swimming pools are fenced with a four-sided isolation fence (do not use your boundary fences) with self-closing and self-latching gates. Life Jackets on boats or simply near the water, such as when fishing, everyone should wear a life jacket – even strong swimmers. Life Guards swim on the beach where life guards are on duty, and at the pool ensure a life guard is present. At both the beach and the pool ensure your watch your children at all times, do not rely on the Life Guard alone. Learn CPR be prepared for an accident – even with vigilant supervision accidents can happen, and CPR is vital in saving the life of a victim of drowning. Enroll in a CPR class today and refresh your training every year. Search online now for courses in your area! Learn First Aid a variety of injuries can occur in and around the water – be prepared with a well-stocked First Aid Kit and enroll in a First Aid course to be ready to help at a moments notice. 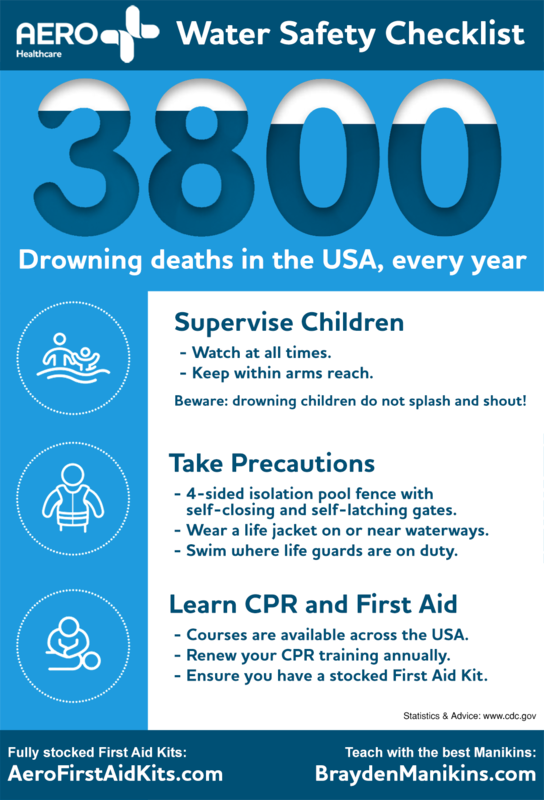 With 3800 deaths by drowning occurring in the USA every year, Americans needs to spread the word. Download our Water Safety Checklist and spread the word on Pinterest, Facebook and Linkedin. Aero Healthcare has a large selection of First Aid Kits for all your needs. Our Responder Series B75 for 75 people, A50 for 50 people and A25 for 25 people kits come stocked in Weatherproof cases with supplies to assist with CPR – perfect for stowing on boats and around swimming pools. Use our Kit Selector now to find the right size and type of First Aid Kit for your needs. Categories: News, US News. Tagged:camping first aid kits | weatherproof first aid kits Bookmark the permalink. Small enough to fit into a pocket, bag or drawer yet full of useful items needed for minor cuts and injuries, this Personal First Aid Kit can be private labeled, making it ideal to give away as a corporate gift or promotional item. Ideal for traveling, commuting or keeping at work – your customers and clients will always have your company in mind with this compact First Aid Kit always to hand. First Aid Kits make for a novel promotional item compared to the usual USB sticks and pens, and a First Aid Kit will give your brand a more personal, caring image. 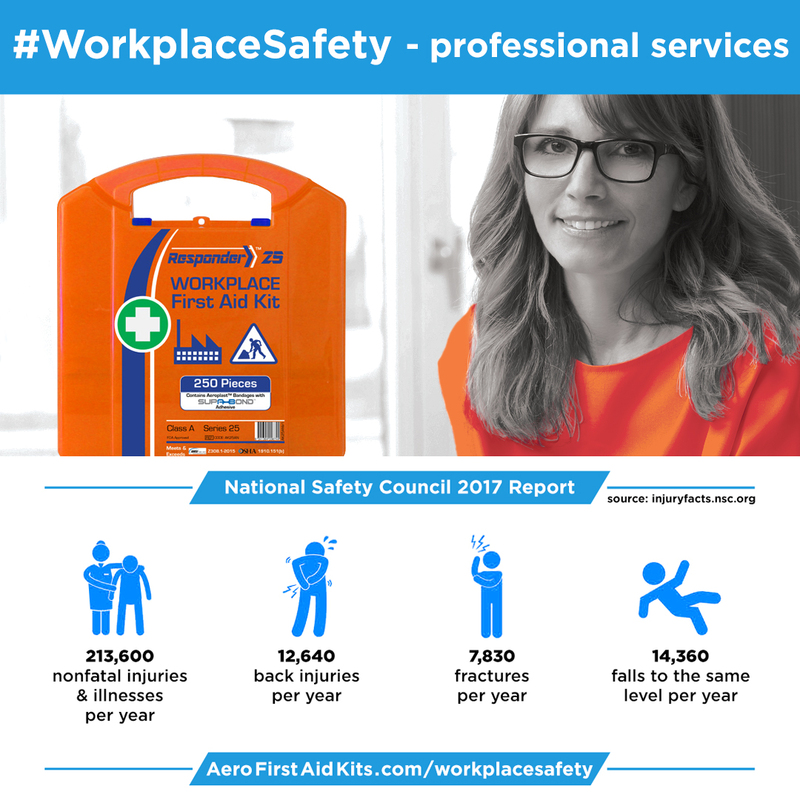 As Aero Healthcare is a market leader in the consumer woundcare market, you can be sure that the contents of this First Aid Kit are of the highest quality – unlike those found on many Corporate Gift websites. 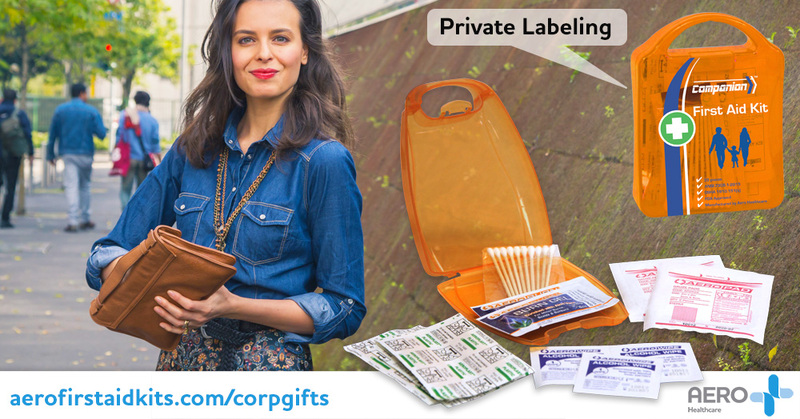 Contact our sales team today for wholesale private-labeled promotional First Aid Kits for your business! For full details and to add to Your Quote, visit the Companion 10 Personal product page. See our full product range of First Aid Kits. Categories: Featured Products, News, US Featured Products, US News. Tagged:gift ideas | nice first aid kits Bookmark the permalink. Burns can range from mild but painful wounds that are hard to ignore right up to a life-threatening injuries. For this reason the vast majority of our First Aid Kits contain supplies specifically for treating burn injuries. We have a category listing all kits containing burn injury treatments with fully-stocked First Aid Kits compliant with ANSI Z308. 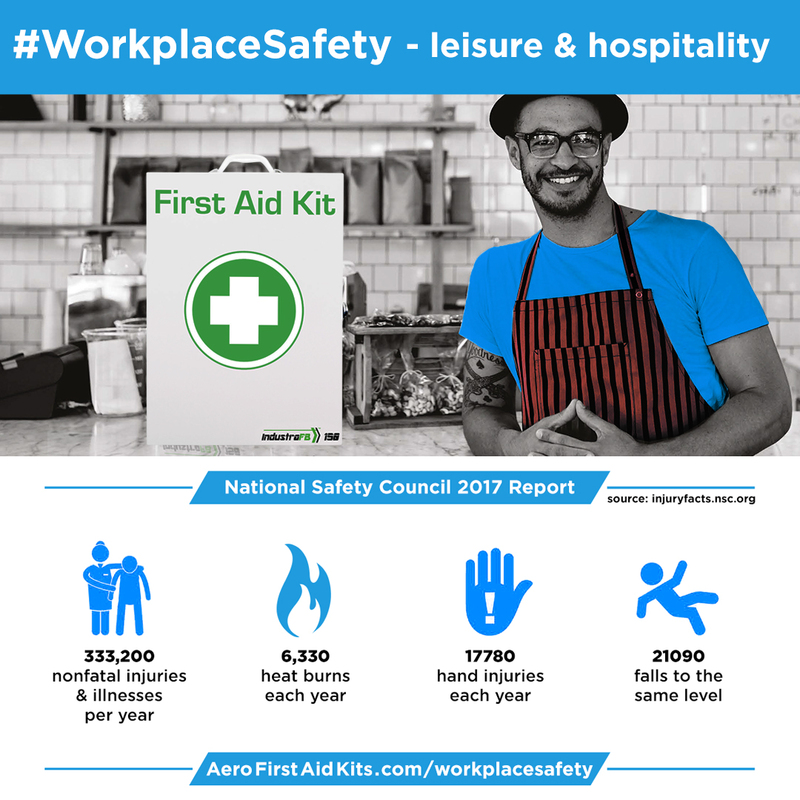 1-2015 and OSHA 1910.151(b) regulations, but did you know Aero Healthcare also have First Aid module kits specifically for the treatment of burns? The intention of these Burns Modules is to compliment your First Aid Kit choice to increase your capability in areas where the risk of burns is high or frequent. To cater for all workforces our specialty Burns Modules are available in a variety of sizes and contain high quality, proven products to relieve the burn and immediately begin the healing process. The rubber sealed plastic cases prevent dust contamination, and as with all our kits they can be private labeled with your business or your clients business branding. 10 kits in up to to 5 case options. Containing 23 pieces, this module services up to 10 people. Containing 46 pieces, this module services up to 25 people. Containing 69 pieces, this module services up to 50 people. And remember, comprehensive burn treatments can be found in a wide range of Aero Healthcare First Aid Kits as listed in our Burns Category. Categories: News, US News. Tagged:burn injuries | weatherproof first aid kits Bookmark the permalink. Both the US and Canda have strict First Aid requirements for businesses that handle food, be they small foodservice businesses such as Cafes and Restaurants, Grocery stores of all sizes and large-scale food-processing industries such as abattoirs, frozen-food processors and factory kitchens turning ingredients into packaged foodstuffs from tinned foods to pre-prepared salads. Aero Healthcare has Food Standards approved First Aid Kits – all our Food-Grade First Aid Kit contents comply with new ANSI Z308. 1-2015 and OSHA 1910.151(b) regulations – in tough metal cabinets sized to suit your clients needs. The cabinets can be carried or wall mounted, and are key-lockable for security. All our cabinets are available with private labeling to promote your business or your clients. Our Food Industry kits contain Aero Healthcare’s famous metal detectable and waterproof adhesive bandages and tape that are colored blue – making them easy to identify as blue is the only color which does not naturally occur in food. These First Aid Kits are the ideal solution for any business where food handling takes place. All kit contents are refilled with our Instant Restock™ system: you can refill and service your clients kits quickly with a single order of refill pouches designed to fit into each cabinet. Categories: News, US News. Tagged:first aid cabinets | food and beverage industry | workplace compliance Bookmark the permalink. 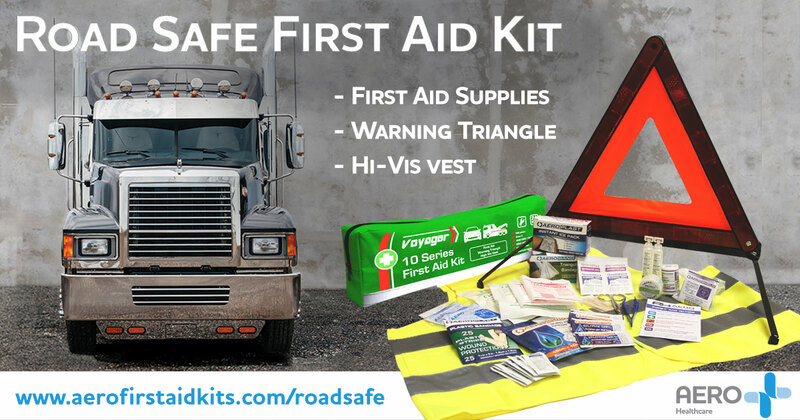 Keeping a first aid kit readily available in your vehicle is a smart move – where ever you go you’ll know there’s a first aid kit nearby should the need arises. But when an accident or injury needs treating while you are on the road, your personal safety and the safety of other drivers becomes a big concern. Aero Healthcare have created a comprehensive First Aid Kit with additional Road Safety features – once you have safely pulled your vehicle over and off the road, put on the included high-visibility vest and remove the red reflective warning triangle from the First Aid Kit, and carefully set up the warning triangle at a distance from the rear of your vehicle. The warning triangle will warn drivers to pass your vehicle with care and to use extra caution, while the reflective vest will ensure drivers can see you. The first aid kit comes with a comprehensive selection of quality first aid products to treat minor and major injuries, with products for burns and to assist with CPR. For full details and to add to Your Quote, visit the Voyager 10 Road Safety product page. Categories: Featured Products, News, US Featured Products, US News. Tagged:softpack fabric first aid kits | vehicle first aid kits Bookmark the permalink. 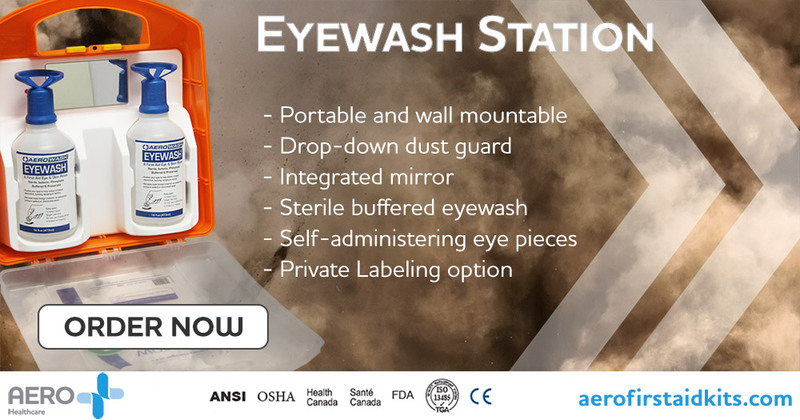 This innovative eyewash station is vital for workplaces with its ability to remove loose foreign material, air pollutants or chlorinated water and to help relieve irritation, discomfort, burning, stinging and itching. The freestanding kit can also be wall mounted, with a drop-down dust cover that opens to reveal an integrated mirror and two easy-open Sterile Buffered AEROWASH Eye & Skin Rinse bottles with eye pieces – easy to remove but securely held in place inside the kit for maximum ease of use when they are needed. The built-in mirror allows the user to find the problem and self-administer first aid with the eyepiece on top of each bottle. Refilling the contents of the Responder 75 Eyewash Station is simple – instantly refill with a single order. Content complies with new ANSI Z308.1-2015 and OSHA 1910.151(b) regulations. For full details and to add to Your Quote, visit the Responder 75 Eyewash Station product page. Categories: Featured Products, News, US Featured Products, US News. Tagged:eye injuries | first aid kit refills | nice first aid kits Bookmark the permalink. Created to comply with regulations for the Food and Beverage industry, this tough heavy-duty metal cabinet can be wall-mounted or carried by a strong handle. 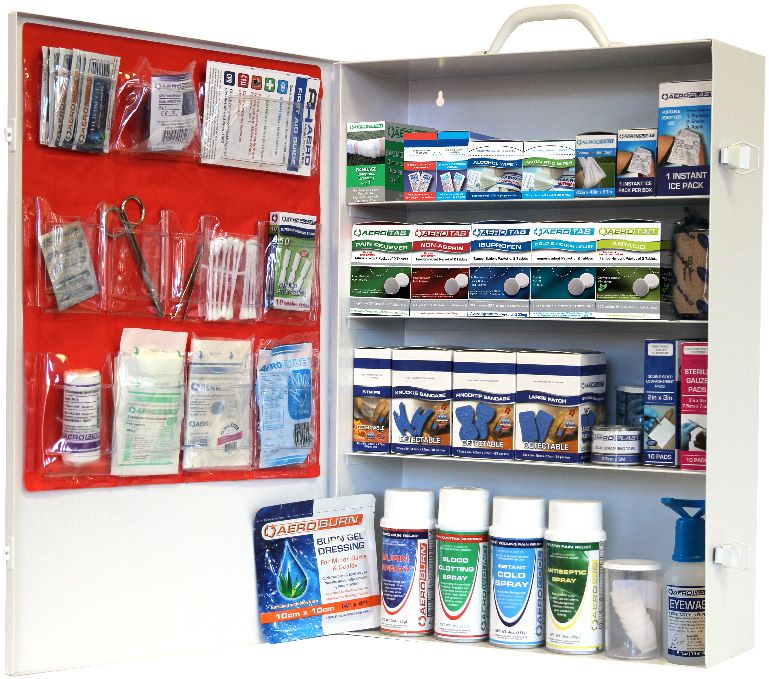 The construction of the First Aid Cabinet includes strong hinges that cover the full height of the door, ensuring it never bends or sags – and can be closed easily every time. A simple to use quality metal clasp keeps the cabinet securely fastened shut, avoiding accidental opening of the cabinet when bumped or carried. The tough metal exterior protects the 949 piece first aid kit contents that include our famous blue detectable plasters, waterproof bandages and tape. A full range of approved relief tablets and medication have been included to help employees deal with common workplace ailments such as headaches, colds and muscle pain. Refilling the contents of the IndustraFB 150 Series is simple – instantly refill with a single order that comes bagged for quick turnaround refilling. For full details and to add to Your Quote, visit the IndustraFB 150 Series product page. Categories: Featured Products, News, US Featured Products, US News. Tagged:eye injuries | first aid cabinets | first aid kit refills | food and beverage industry | metal first aid kits | tough first aid kits Bookmark the permalink.